Northlane have released a stream of their cover of Tame Impala track Let It Happen. The Australian outfit decided to record the track by fellow countryman Kevin Parker and his band as they say they share similarities when it comes to how they write material. 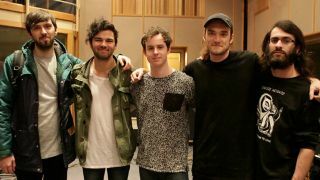 Northlane say: “We’d been wanting to do a cover for quite some time but because we all listen to fairly different music, we could never come to any sort of conclusion about what artist or song to choose. Northlane reveal they had planned to record the cover during their recent BBC live session in London but ran out of time. Deiley, Marcus Bridge, Alex Milovic, Josh Smith and Nic Pettersen released their third album Node earlier this year and are currently on tour across Australia.